There are many games coming out this year that are the continuation of popular game series, but BioShock Infinite may be the best game to release this year. Although it tends to get grotesque at times, and the side quests leave something to be desired, it has all the elements of a well-written game and the story is executed well. BioShock Infinite takes place on the Sky Ship Columbia in the early 1900’s; a floating city above the United States meant to be a utopia. Columbia is run by Comstock, a self-proclaimed prophet. Fink controls the city economically by over-lording the people he oppresses by making them work in his factories and tells them that it’s good for them. Daisy Fitzroy is the rebel leader of the Vox Populi that rebel throughout the game in order to gain a new place in society. Booker, the main and only playable character, was sent to Columbia to rescue Elizabeth from her tower. She has only had access to a large library and her only outside contact was with her guard, a giant mutant mechanical bird called the Song Bird. Unbeknownst to her, she has been observed and studied since she was born. There is a pair of NPCs that throw an amusing curveball at Booker every now and again. Brother and sister duo, Robert and Rosalind Lutece give Booker choices, make him consider many new concepts, and help him at points. To help him they speak in riddles and bicker with each other. They are both innovative physicists. Rosalind was credited with Columbia’s ability to float, and is heard mentioning quantum theories that weren’t considered until decades after her death in 1909. Robert is the one who discovered the tears (eventually becoming Elizabeth ability in the game) and died at the same time as Rosalind, due to being stuck in a tear. That death essentially made the two of them ghosts, making it easier to follow Booker and give him random choices. The first thing a gamer looks for in a game is the graphics. Poor graphics usually kill a game, even if it has a good story. However, when a game has good graphics; like BioShock Infinite does, the other characters look more realistic and are easier to see. Because it isn’t delayed, movement is easier and it’s easier to respond to attacks. The detail of the graphics also allows for more artistic freedom in the game. The tendency of good graphics means that you can see everything really well. Normally that is a perk, but when a game has gore, it isn’t always a good thing. BioShock Infinite has many messy kills and is also realistic to the cleanliness, or absence of, in different realms of society because of racial differences. The good graphics mean that the gore of blood spurting from a decapitated body is very realistic. Another big thing that can make or break a game is the size of its world. When going through life, all of the past history affects life now. Even old comics, books, and TV shows affect modern entertainment. When creating a game, not only do the publishers have to consider the main character’s past, but the past in the game world as well as what is currently popular to society in the game. Games that fail to do so are sometimes considered bland and restricted. BioShock Infinite is certainly not bland. It has a large world that covers nearly half the world we’re already familiar with, from the fictional Sky Ship Columbia to New York and Paris. One nice thing about games that are written into a large world is that there are a lot of optional side quests. However, BioShock Infinite has infrequent side quests. Some of those side quests are annoying to complete. Most of these annoying quests involving finding a key or a code for a safe that had been found before, but seems nearly impossible to try to find again. Although BioShock Infinite is a great game, it would be perfect if it had multiplayer. Right now there are two main characters that work together, but only one is playable. If the second character, Elizabeth, were playable, she could help Booker by chasing down health packs, more ammo, and Silver eagles, the currency in the game, rather than having to wait for the AI to find the needed items. As with any form of entertainment, a good story helps to make BioShock Infinite a great game. The developers found a way to look at the same city, the same story even, from multiple perspectives. Elizabeth has the ability to make a tear out of thin air. On the other side of that tear is another place, or another time. In the game, Elizabeth can make small tears to get helpful things like guns and medical kits for Booker. The bigger tears affect all of the Sky Ship. Depending on the small thing that Elizabeth changes when she makes a larger tear, all of the history of the sky ship is affected by that small change. It shows how even little things can affect the big scheme of things. The Lutece siblings introduce Booker and Elizabeth to a new functionality in the game in a very interesting way. Looking at two sides of the same coin truly describes the attention to detail in BioShock Infinite. When creating the story, writing all the answers to the “what if” questions, the creators wrote a lot of small details that help to flesh out the story. Tiny irrelevant coincidences and small amusing stories are entertaining and help the game to seem realistic. Tiny peaks at the lives of the “normal” people in the game complete the created world of the sky-ship Columbia. An issue for games that go back into history for the setting is the fact that they have difficulty avoiding making a change to history in order to write the game. In an effort to avoid damaging too much American history in the early 1900’s, they created the floating sky ship Columbia. Although there are zeppelins and blimps in the story, Columbia is floating on fixed quantum particles. That isn’t accurate working science of the times, and trying to wrap the mind around that concept is confusing and distracting at first. What is accurate is the racial divide. There is a racial divide between the whites and the blacks called the Vox Populi in the game. Also accurate are the racial slurs, the separate bathrooms, the placement in social order, and the uprisings. In order to get around the city, Booker uses Skylines. The Sky Hook is a contraption that connects to the Sky Lines. Booker can attach to the Sky Line using magnetism between the two devices. The Sky Hook can also spin quickly and be used, with similarities to a saw, for some messier melee kills. This multi-use tool helps make BioShock Infinite stand out because of it originality. Every character was obviously thoroughly thought out, from the main characters to the “tiny” insignificant people. Each character adds to the story. 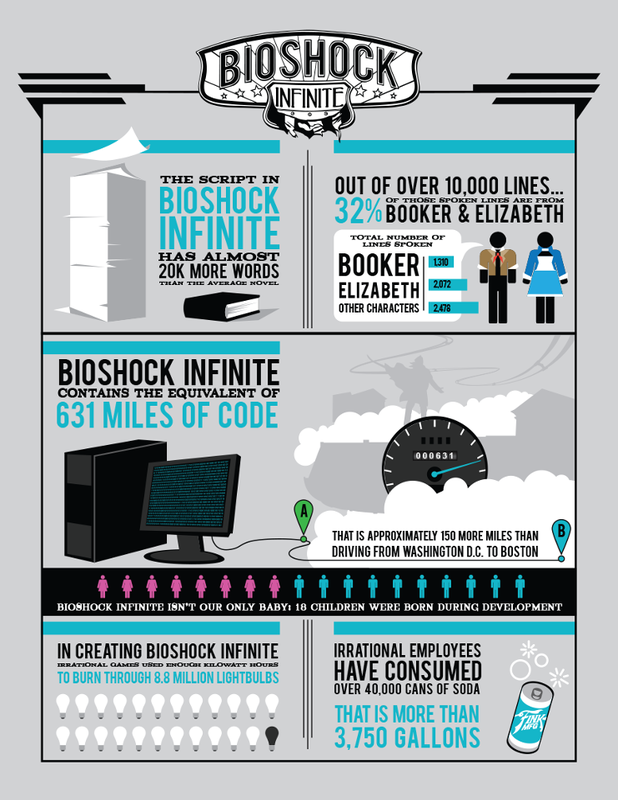 According to the publishers, BioShock Infinite’s dialogue script contains more than 10.000 speaking lines, and Booker and Elizabeth had one thousand and two thousand lines respectively. Although there seems to be and overly large gap missing, when you consider the large main NPCs of Fitzroy, Fink, and Comstock and all their rants, plus all the minor enemies’ catch phrases, then the normal conversations you can hear snippets of as you play, the truth of just how many lines there are makes sense. This is actually a better balance than when the main character is the only one talking, or when it doesn’t talk at all, as can be found in many other video games. In order for a story to be a story, there needs to be conflict. Strong, well thought out enemies are as important as the characters. From the tiny Vox Populi militia, to the mid range bosses like the Fireman, the Patriots, and the Handyman, all have their strengths and weaknesses. In order to exploit those weaknesses, the main character is given eight powers called Vigors. BioShock Infinite’s attention to detail and amazing graphics deserve to be considered game of the year by gamers everywhere. To top it off, the amazing story and amusing NPCs like the Lutece siblings make it a wonderful story. Although it doesn’t have a two player mode, I will certainly be playing (and replaying) BioShock Infinite frequently in the foreseeable future. Next Post 3 years! Success!